Will Allen (left) and Eagles safety Malcolm Jenkins (center) listen as Kevin Ring (right), founder of Families for Justice Reform, explains he is a Redskins fan as they take a tour in Philadelphia. Mandatory minimum sentencing for non-violent crimes has been shown to affect black and brown people disproportionately. If you look across the country at those incarcerated because of drug possession in a school zone, that number is even more lopsided. 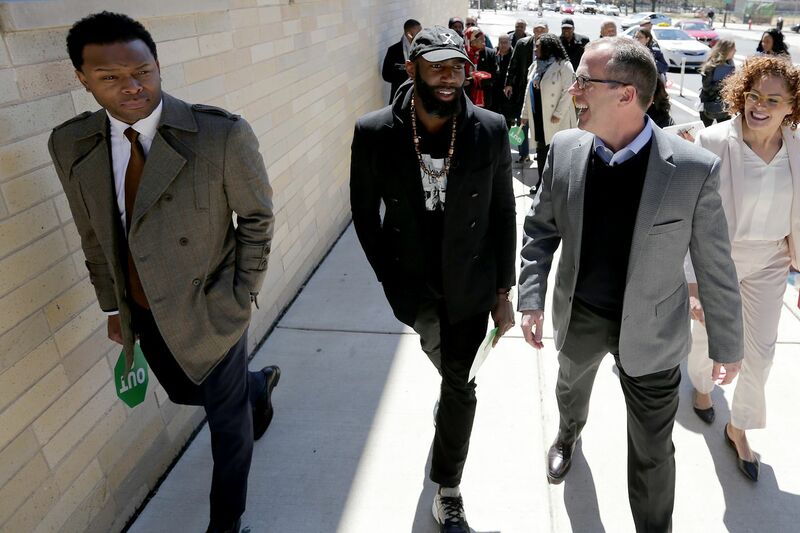 Jenkins and former Pittsburgh Steeler Will Allen of the Players Coalition partnered with a D.C.-based advocacy group, Families Against Mandatory Minimums, on Monday to tour a Spring Garden-area school zone. As you stroll through any Philadelphia school zone, you likely won’t see a sign or indicator of when you are inside/outside of the 1,000-square-foot zone. Often in urban communities, those zones overlap. “It’s directly targeted,” Allen said of the mandatory two-year prison sentence on top of whatever the judge gives for the charge of drug possession in a school zone. "You look at those communities and you don’t see those demographics thriving; you don’t see those demographics any safer. It actually has caused more trauma to the families, and you wonder why. " Malcolm Jenkins (left) joins local politicians as they try to guess if they are standing in a school zone near 22nd and Spring Garden Streets in Philadelphia. The Pennsylvania lawmakers in attendance were Rep. Jason Dawkins, Sen. Anthony Williams, Rep. Joanna E. McClinton, and Sen. Sharif Street. The group walked from Whole Foods on Pennsylvania Avenue to the Eastern State Penitentiary, stopping along the way to guess if it had left or come back into the school zone. Allen and Jenkins said the scariest part about it is you just don’t know. The Pennsylvania Supreme Court deemed the Commonwealth’s drug-free school zone law invalid with a 3-2 ruling on an appeal of the law in 2013, but in 2017, Rep. Todd Stephens, (R, Montgomery) introduced a variation of the old law to the House floor. It was later shot down by the Senate. Since then, there have been conversations about reintroducing the law, but it hasn’t materialized. Jenkins (left) pauses during the tour. Lawmakers around the country have peeled back on mandatory sentencing for non-violent crimes in the wake of criminal justice reform. Stephens’ push to bring this law back into effect came as a surprise. The bill would add mandatory sentencing for certain drug crimes and violent offenses against the elderly and infants. Jenkins said Monday was the first time he had spoken with lawmakers about this law. He said the next step would be to get in contact with the politicians who weren’t in attendance. From 1999-2002, Families Against Mandatory Minimums found that 84 percent of drug-possession offenders in Pennsylvania school zones were residents of color. In Massachusetts, 80 percent of school-zone drug offenders are people of color and in New Jersey, it’s 96 percent, heightening the concern for Jenkins and those who are part of the Players Coalition that a city as diverse as Philadelphia doesn’t carry a law such as this.